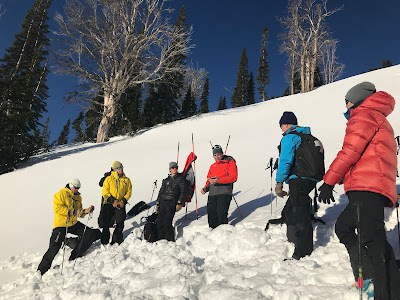 Over four days from November 26-30th of 2017, the greater Teton community of professional avalanche workers banded together to participate in an inter-agency professional avalanche rescue workshop led by Manuel Genswein from Saint Mortiz, Switzerland. One hundred and twenty five (125) participants from eleven (11) organizations participated. Agencies included Teton County Search and Rescue, Jackson Hole Ski Patrol, Grand Targhee Ski Patrol, Jackson Hole Mountain Resort Guides, Exum Guides, Jackson Hole Mountain Guides, Bridger-Teton Avalanche Center, Tordrillo Mountain Lodge, American Avalanche Institute, GTNP Jenny Lake Rangers, and High Mountain Helicopter Skiing. 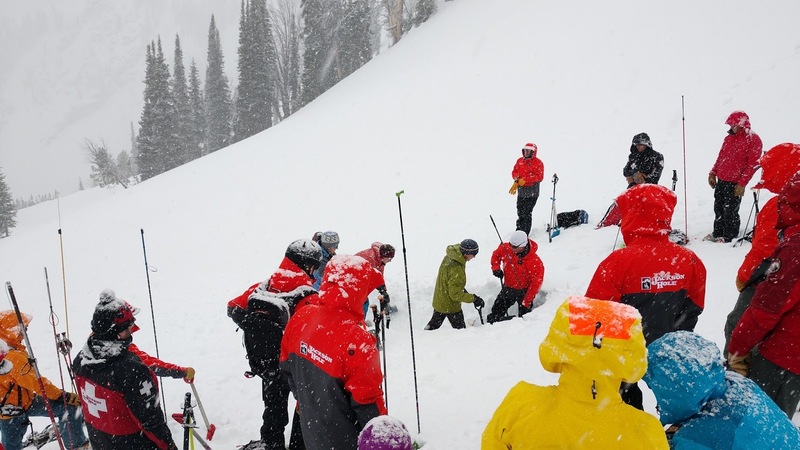 To cross-pollinate with other professional avalanche rescue workers within the Greater Teton area. North-West Wyoming has a high concentration of professional avalanche workers. However, we have limited professional interaction. To receive training from someone outside of our typical sphere of influence. Manuel Genswein, known for his meticulous research into efficient avalanche rescue techniques, has been developing an international avalanche rescue curriculum for several years. Other than seeing some of his presentations at ISSW, no one in the local area had attended on of his courses. In order to accommodate such a large group, Genswein trained 22 designated "Trainers"(representatives sent by each participating agency) on November 26-27th. On November 29th, over 100 participants attended a classroom day with Manuel Genswein at the Teton County SAR hangar while Trainers set up field workshops for the following day. On November 30th all Participants and Trainers met at the Jackson Hole Mountain Resort to work through 6 different field workshops led by the Trainers. 1. Excavation: Conveyer Belt Shoveling, including new updates to maximize efficiency. 2. Probe Line Techniques, including Slalom Probing. 5. Advanced Mulitple Burials: Alternative Search Methods including Micro-Search Strips and Micro Search Box. 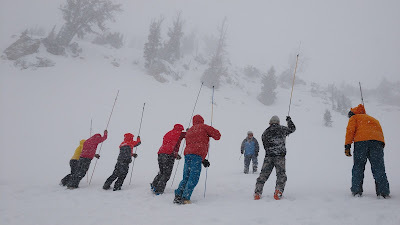 As hoped, we managed to strengthen the relationships between the many professional organizations in the region, while at the same time exposing the professional community to an international avalanche rescue curriculum which has officially been adopted by many national alpine clubs across the globe. Genswein’s professionalism, teaching skill, and precision with technique was impressive to all that attended. This workshop strengthened our professional community and helped everyone that attended continue to strive towards excellence in our given professions.